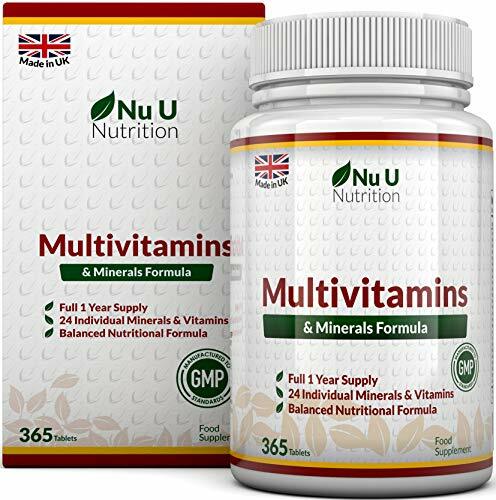 The Nu U Nutrition Multivitamin and Mineral Formula for men and women is market leading with 24 vitamins and minerals in each and every tablet. ADVANCED FORMULA - Our Vitamin & Mineral Formula includes a balance of 24 separate vitamins and minerals, specially selected for their health benefits. The tablet has been designed to be easy to swallow. UP TO 12 MONTH SUPPLY - Amazing value, so simple no need to reorder for a full TWELVE months if you take one tablet day. ✔ CONVENIENT SOURCE OF 24 VITAMINS AND MINERALS - Get the benefit of 24 individual vitamins and minerals in one easy to swallow tablet. Each tablet includes Vitamin A, Vitamin D, Vitamin E, Vitamin K, Vitamin C, Thiamin, Riboflavin, Niacin, Vitamin B6, Folic Acid, Vitamin B12, Biotin, Pantothenic Acid, Calcium, Phosphorous, Magnesium, Iron, Zinc, Copper, Manganese, Selenium, Chromium, Molybdenum, Iodine and Lutein. Giving you a high strength multivitamin. ✔ SUPERCHARGE YOUR HEALTH - Each vitamin has been carefully selected to help you. Vitamin A for instance support vision, skin and the immune system. Zinc supports metabolism, cognitive function, protein synthesis, maintenance of normal bones but also the metabolism of Vitamin A. We cannot detail all the supporting functions of the vitamins but each one is selected carefully to help you get the full benefit of the Nu U Nutrition Vitamin and Mineral Formula. ✔ UP TO 12 MONTH'S FULL SUPPLY - Our incredible 365 tablets pack gives amazing VALUE keeping you replenished with a range of 24 vitamins and minerals for up to 12 months. No need to remember to reorder every month with up to 52 week supply. ✔ TOTAL PEACE OF MIND WITH OUR UK MADE PRODUCT - Many vitamin and mineral supplements have been imported from other countries, including Asia and the US, often simply bottled in the UK. Ours are made RIGHT HERE in the UK so you are safeguarded by the highest standards in the world. It is suitable for vegetarians FREE from milk, lactose, gluten and wheat, providing you with the best multivitamins possible.